Forget the big salad bowl! 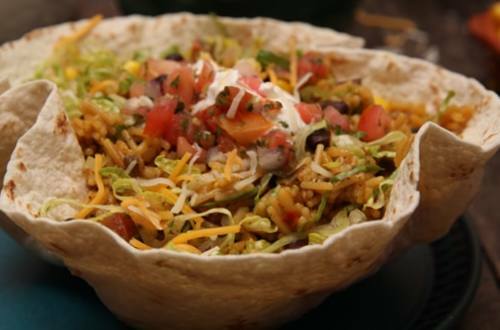 Wow your table by serving this taco salad in restaurant-style tortilla bowls. Serve it as a starter or as a main dish—it’s memorably delicious either way. 1 Press 1 tortilla into a 4-cup microwave-safe bowl to form bowl shape. Microwave at HIGH 1-1/2 minutes. Let cool 1 minute. Gently lift out and arrange on serving plate. Repeat with remaining tortillas. 2 In saucepan used to cook Spanish Rice, combine rice, black beans and corn; heat through. 3 In tortilla bowls, evenly arrange lettuce. Evenly top with rice mixture, then sprinkle with cheese. Top, if desired, with your favorite taco toppings such as chopped tomato, chopped avocado, salsa, sour cream and/or chopped fresh cilantro.